Smart plugs are insanely popular right now because they’re the best and least expensive way to add some smarts to your old “dumb” devices like fans, lamps, and even coffee makers. Of course even though they’re cheaper than other options, they still typically cost between $20 and $30. The EPICKA Mini Wi-Fi Smart Plug is just like all the other models out there, but with two main differences. First, it works with both Amazon Alexa and Google Assistant, not just one or the other. Second, it only costs $13.49 with the 10% on-site coupon instead of $30! 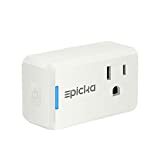 【SMART CONTROL】-EPICKA WiFi Smart Plug mini Compatible with Amazon Alexa and Google Assistant.You can control home appliances with your voice. 【LATEST TECHNOLOGY】-EPICKA WiFi Smart Plug mini is connected to App to control devices wherever you have WiFi or Cellular Networks on your smartphone. 【AUTOMATIC TIMERS】-You can set specific schedules and timers on EPICKA WiFi Smart Plug mini for home appliances to power electronics on and off as needed. 【GREAT SECURITY】-Uses Leave Home Scene to turn devices on and off at different times to look like you’re home even when you are not. 【SERVICE WARRANTY】-30 days Money-Back Guarantee and 1-Year Limited Warranty.Value for money guaranteed, Buy EPICKA WiFi Smart Plug mini worry free.